The Hitman series is one of the longest running franchises in modern gaming, and has graced our games consoles for well over a decade, but it never really took off like some of the others. Tomb Raider and Assassin's Creed are a couple of examples that come to mind that achieved a higher level of critical and commercial success than Agent 47 ever did. That's not to say they are bad games though, the gameplay just didn't feel quite as polished as it could have done. Now, Square Enix have released a spin-off, mobile game, and it's unlike any other game in the series. Read our full review below to find out why, and if it's worth your time. 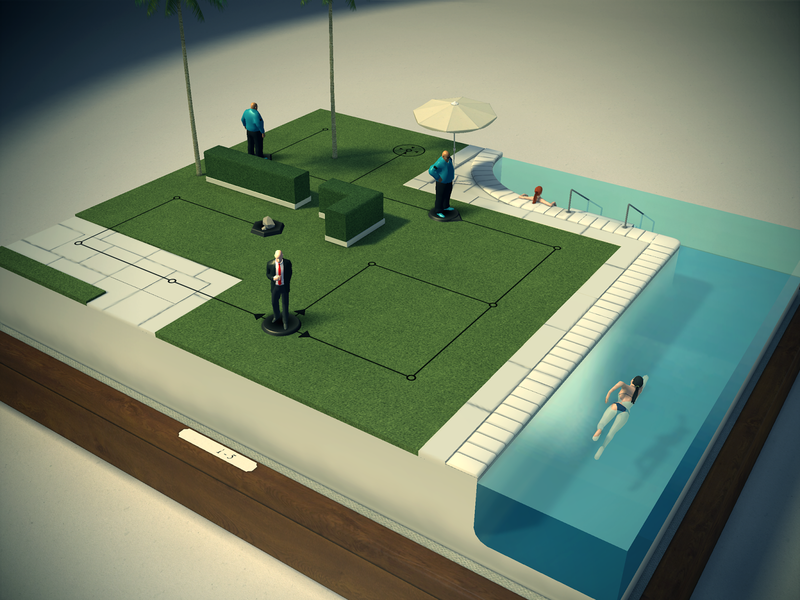 Hitman GO is basically a puzzle game combined with a board game. It's an unusual mixture, but it actually works, really well. Each level is a small diorama of an area, with a grid that allows character movement, and usually a few enemies. You get to move one space, then the enemies do. So you can often lead them into traps, but just as often, they'll catch you. There are also elements from the core franchise in GO too, such as the ability to find and throw rocks to lead enemies to a specific area. This can offer you amazing opportunities to get multiple kills in one move. Some of the enemies are static, but some walk in set paths, which you have to pay attention to if you want to survive. If you can approach an enemy head on or from behind, you knock out their figure. If they approach you though, it's game over and you have to start again. Different enemies require different tactics, and it gets really challenging, very fast. Each level also has extra challenges, such as completing it in a certain amount of moves, or picking up a collectible, to killing all or no enemies. The harder challenges do become quite addictive, and you just want to keep retrying, and you'll get a lot of satisfaction when you eventually complete them. 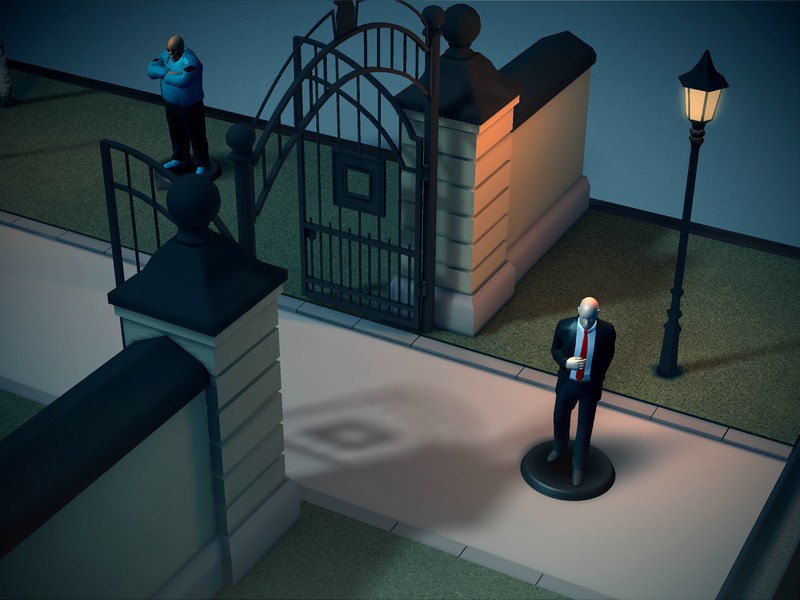 What's awesome about Hitman GO is that it doesn't hold your hand through the tutorial. It basically starts you off in very simple levels, before adding elements slowly, until you've been shown enough to be able to play properly. The difficult curve is pretty steep after the tutorial section, and many of the levels require a lot of thought, and trial and error, for full completion. Graphically, it is gorgeous. The levels and character models are really detailed, and even the UI on the menus is worth mentioning. It's minimal and very stylish, and suits the game perfectly. As mentioned earlier, each level is a diorama, which brings some really interesting visuals. Outside of the playable area, there are often characters and environments that you can't interact with, and there are some really creative areas. One has a swimming pool to the side of the level, with a figure swimming, but frozen in time. The pool is also on the edge of the level, and is cut off right down the middle, so you can see an awesome cross-section of the water. There are too many examples of this to mention them all, but each level is a treat to look at. All in all, Hitman GO is an amazing entry to a long-established series. It takes everything you know about Hitman, and shrinks it down to a board game. And the funny thing is, it's one of the best and most memorable in the series. You should absolutely download this game. It's cheap, unique, addictive and highly polished. What more could you ask for? On of the best ways to get some profit together with fun is to play the games that have skins and then sell them on skinsmarket.com.